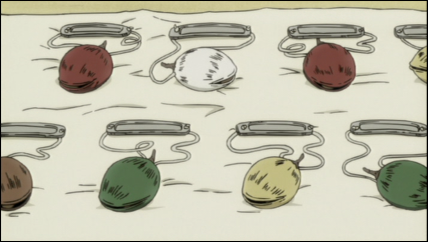 The handing out of the nuts nicely pulled things together for all the characters, tying together any loose ends for the minor characters in the series, from the used clothing dealer to the guy working at the bar to Sumika and her newborn. Within the wall stand memorials for all the haibane who have reached their day of flight. Each haibane is given a name for their dream upon arrival, and on the memorial a new name, a name for who they have become. 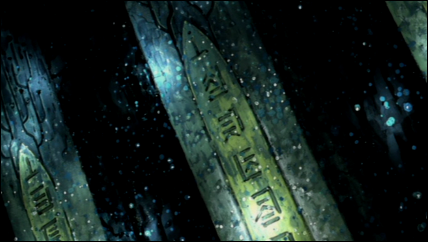 But, how does this name carved into the stone come to be? Do members of the council carve them? 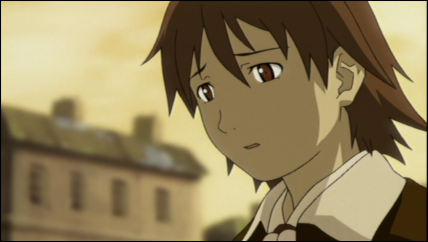 And how does the memories of a haibane become associated with that stone? 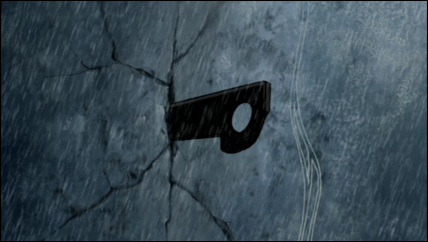 Or is the stone already associated with the haibane, this being to reason it is chosen to carve into? Up until now, Rakka found herself at a loss as how to help Reki. Rakka had a bird forgive her, but there was nobody to forgive Reki. Reki cannot simply forgive herself, and Rakka cannot forgive her for anything. Hyohko had already forgiven Reki, but Midori continued to hold a grudge. But it can’t be the forgiveness of Hyohko or Midori required to be cured of being sinbound, for she was sinbound from birth. Even though Reki would have given Hyohko and Midori the nut, and Hyohko would have displayed the fireworks, had Rakka done nothing, it’s possible Midori wouldn’t have been as willing to help out. On top of this, if it weren’t for Rakka, Reki would not have seen the message of forgiveness sent to her. Not that it would matter. The communicator gave Rakka Reki’s name box, telling her to give it to Reki after the festival. Did he know things would be resolved by then? How could he know? Does he hear the thoughts of Reki, Rakka, Hyohko, and Midori, thoughts collected by the wall? Also, did he know Kuu’s new name? Was there a name box taken to Kuu? Does he read the stones within the wall to learn when a name changes? Does a name change signify an upcoming day of flight, or does the stone change its displayed written name after the flight (or lack thereof)? They way he spoke to Rakka after she signed the name sounds as if he didn’t know Kuu’s name, but it could have been surprised to see her signing Kuu’s name with its latter meaning. Back when Hyohko tried to climb the wall, he struck a wedge into it, and the wall responded. 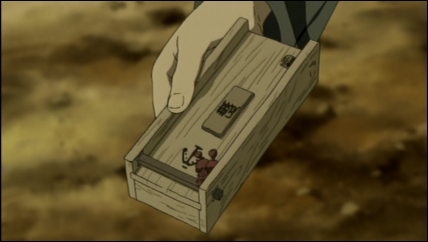 If the goal were to keep the haibane safely inside, would pushing Hyohko send a message to not try to climb the wall, even if he were to die for it? 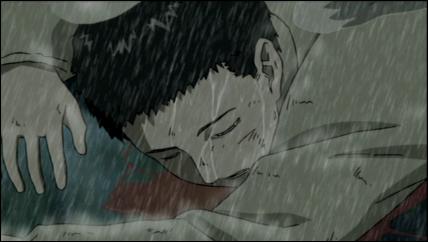 Or did touching the wall numb him from all pain, as it did Rakka, allowing him to remain safe, until he could be healed? Another possibility is that the wall was acting not to keep Hyohko safely inside, but out of self preservation. It had just taken an attack, and the only recourse would be to strike back. It thrust out the wedge with no concern of Hyohko’s position below. Five years prior, there was a falling out between Reki and Midori, and Reki and Hyohko were to be kept separate from one another. 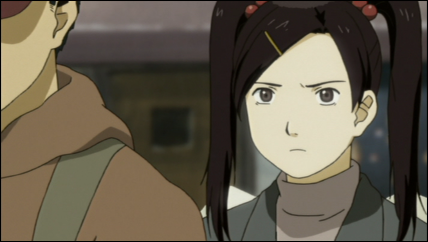 The communicator previously spoke of Reki coming to the end of her time as a haibane. This cannot be a time limit on a haibane within the walls, as Nemu has been a haibane longer, and Hyohko and Midori have known Reki since shortly after Kuramori left. Before going in to see Nemu last episode, Reki skipped out on having a cigarette. 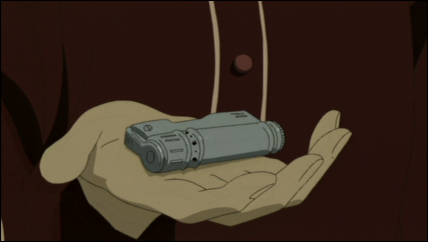 Now, she’s given her lighter away, proclaiming her lack of need for it anymore. She’s finally taken initiative in her final days, initiative to change her habits, to do the best she can in what little time she has left. Reki failed to go to the festival due to having things to finish up in Old Home. Her scene helping Hikari suggests Reki planned to make a celebratory meal, something grand for her to be remembered by. 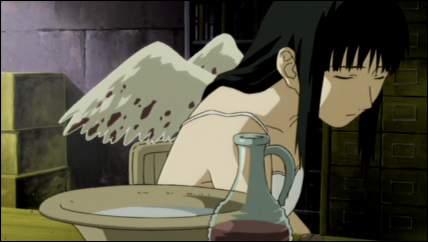 Unlike other haibane before her, Reki doesn’t hide her upcoming departure, even though it may not be apparent to anyone other than Rakka what is to come very soon. I finally understand the circle of sin completely. As made clear in a prior episode, one can only be free of their sin once they’ve acknowledged their sin. However, freeing yourself from sin would be a sin in itself. Only when you acknowledge your own sin, and make your acknowledgment (your apology) know to the one you’ve sinned can you be forgiven. You cannot forgive yourself, but being aware of your sin is the first step to being freed from your sin. And this one cannot done alone. The important question not raised this episode is: What happens if you go to take a bell nut to someone, but they’re not at home or at work, because they’re on their way to your home or place of work to give you a bell nut? In a way this is what happens with Hyohko and Reki, as Reki isn’t in town to be greeted by Midori to point out the fireworks. For everyone else, this is surely an issue that’s come up and been fairly well resolved over the decades. Ah, the mysteries of this town and its people. I think the remaining anchor fell out just because it wasn’t secured well. Anyway, come on. We know you’ve seen all of it already. Is it great or what? Also, do you see how Reki’s story grows in importance as the series progresses and overshadows Rakka’s story? About the circle of sin- I think I interpret it differently. I think the idea that it’s impossible to move on. If you can see your own sin and feel remorseful, it isn’t there. But it is there, because you are still aware of it. So if you try to forget and move on due to the fact that your sin is now nonexistent, it comes back because you’ve stopped acknowledging it. So in the end, you are either a sinner wallowing in ignorance of your sin or a clean soul wallowing in remorse. Am I just saying the same thing as you? I can’t quite tell. It’s a very complicated idea, but the above explanation makes sense to me at least. Sorry for a belated reply — I’ve had computer issues.